Within each noh there are a number of sections with names like kuse or kiri in which the chorus and the musicians are playing together in rhythm while the shite dances. Of course noh has given these sections their own name when performed only in traditional Japanese formal attire. These excerpts are known as shimai when performed out of the context of a noh. Each of these dances is made up of very detailed kata (movement patterns) strung together in a fluid series. Some kata abstract, while others are clear gestures. 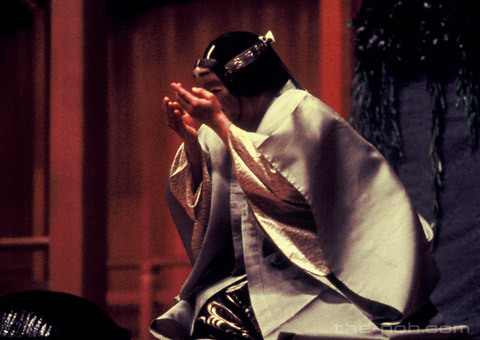 It would be safe to say that the performing of noh is made up of the composition of very small pieces. Kata are the basic movement patterns of noh. Each kata is given a name and that kata becomes an important fiber in the fabric of the art of noh. The most basic kata from which all other movement is based is called kamae. This is the basic posture for the noh performer. In the lower body, the knees are slightly bent, lowering the center of gravity of the performer. In the upper body, the arms are slightly bent, elbows out, making a kind of circle shape with the arms and in the right hand a fan is held. The basic form of movement is called hakobi. While maintaining the same center of gravity as in kamae, the feet are slid across the floor one after the other, without lifting them. In order to change direction, for example to turn left, the right foot is hooked around the big toe of the left. Then by twisting on the ball of the feet, one foot at a time, the feet will become even and the turn is complete. In order to express sadness or grief, the kata known as shiori is used. For shiori, the head is slightly bent down and with either one or two hands (depending on the severity of the grief) the eyes are covered indicating the shedding or stifling of tears. Sashi is another kata in which the hand holding the fan is brought back even with the body and then in an arcing motion is put in front of the eyes essentially pointing off in the distance. Sashi can be used for pointing up at the mountains or down at the sea and may coincide with the descriptive text being sung by the chorus. While each kata is used to express a specific emotion of scene, the same kata can be used at different times to express different things. Noh performers take finely detailed kata and within the dance turn them into a series of successive, fluid, emotive motions, that in turn give emotional expression to noh. As mentioned previously, a shimai is a short dance section extracted from a whole noh. There are a number of types of shimai, including the principle sections of the kuse and kiri. Shimai sections are generally used to describe either the location or the emotional state of the shite. A maibayashi similarly is an extracted section of a noh and contains at least one shimai section in it. Whereas a shimai is performed with just a few chorus members singing for the shite, a maibayashi includes musicians as well as a chorus. Both shimai and maibayashi are performed not in full costume and mask, but simply in Japanese traditional formal wear: montsuki (kimono adorned with a family crest) and hakama (large silk pantaloons resembling a skirt). The shite will of course uses a fan, but not a chukei, a fan used in a full noh performance. The person performing as shite in shimai or maibayashi uses a shizume fan. Please take a look at an interview with Fukui Yoshihide, the president of a well known noh fan shop, Tomatsu Ya Fukui Senpo.